You spend a lot of time working with the keyboard on your smartphone, so any little improvements or tweaks you can apply here can make a big difference to your mobile life. If you’ve never ventured beyond the confines of your phone’s default keyboard, here are a few of the upgrades you’re missing out on. It’s time, whether you’re on Android or iOS, to make the plunge and tryout some new keyboards. Once you’ve installed a third-party keyboard or four, you can enable them in your phone’s settings app. On Android, tap System, Languages & input, and then Virtual keyboard and Manage keyboards to make your choice. On iOS, tap General, Keyboard, and Add New Keyboard; once enabled, keyboards can be selected with a long press on the globe icon to the left of the spacebar. Some extra configuration may be required to get the keyboards up and running fully on your phone, but the keyboard apps themselves will guide you through the process. All of these apps are free to use or at least to try, unless otherwise specified. The default keyboards for Android and iOS have plenty going for them, but cutting-edge design perhaps isn’t at the top of the list. Many of the keyboard add-ons out there go much further in terms of customizations and theming, so you can get something more suited to your tastes to tap out your words on. Fleksy for Android and iOS is a good bet here, allowing you to tweak the colors and shades yourself, as well as slap on pre-made themes (some of which you’ll have to pay for). Minuum for Android and iOS also has a decent selection of colors to choose between, and gives you the option of shrinking keys down to a more compact size too. Although it’s not the keyboard’s main selling point, SwiftKey for Android and iOS has a selection of tasteful themes to choose from and even lets you load a photo for your keyboard background if you must. And from China comes Typany Keyboard for Android and iOS—it feels sort of like the ultimate in bright and varied keyboard themes, if your eyes can take it. A good autocorrect system can really help you fly through your messages, emails, and web searches, and a bunch of keyboards promise to do better than the default Apple and Google options for predicting what it is you want to say next. At the front of the queue is SwiftKey for Android and iOS, which has long been using advanced neural network AI to work out what you’re going to say next. It’s got the smartest autocorrect and word prediction technology we’ve seen, and the more you use it, the more accurate it gets. 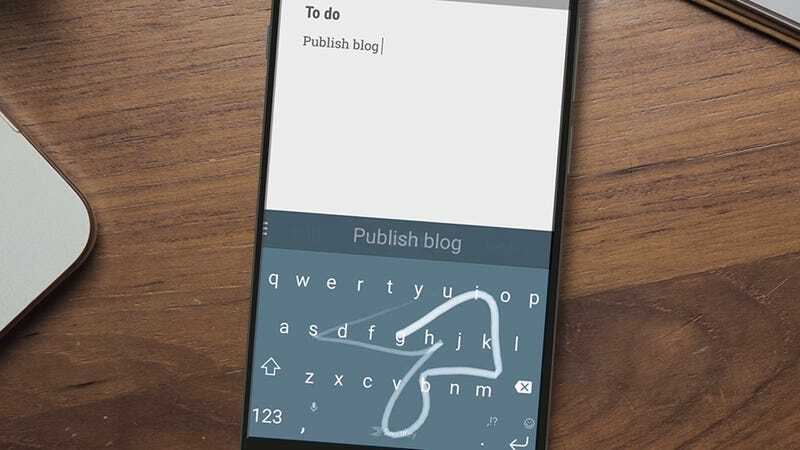 Several other keyboards mention trying to improve their predictions over time thanks to some hidden AI smarts, the best of which appears to be Chrooma for Android, a keyboard which also offers customizations, GIF searches, and a night mode. Google’s keyboard comes with built-in search because of course it does. If you own a Pixel or stock Android phone, you should have it already, otherwise you can download Gboard for Android or iOS for free. If you tap the arrow or Google icon to the left of the autocorrect bar you can start running your queries. While space is limited inside a keyboard, you can search the web for anything—news, restaurants, websites—and then share the results in whatever app you’re using. So, for example, you can search for a local restaurant through Gboard and then share the link inside WhatsApp so all your friends know where you’re headed. Fleksy for Android and iOS goes even further, letting you look up sites, images, and videos on the web, as well as run specific queries on YouTube, Spotify, and Foursquare. It works really well and is even more comprehensive than Google’s offering, though maybe not as polished overall. Animated GIFs and emojis can bridge the communication gap when mere words just aren’t adequate, and a bunch of keyboards out there make it easy to search for and drop in little pictures and icons in the midst of your conversations. There’s decent support for these features in the default Android and iOS keyboards, but you can do better. A lot of these apps we’ve already mentioned: Minuum for Android and iOS adds emojis to its word predictions, in case you want to use them instead of the next word, while SwiftKey for Android and iOS also predicts which emojis you might want to call on next. GIF searching comes integrated into Gboard for Android and iOS, Chrooma for Android, and Fleksy for Android and iOS (which has one of the best implementations we’ve seen), and several more. On iOS, you can add Giphy as an extension inside iMessage (tap the App Store icon to the left of the text input box, then search for Giphy). The default Android keyboard already lets you swipe to type—tapping and holding and dragging across letters rather than tapping on them individually—but a bunch of third-party options let you add the same functionality on iOS, or let you use it in a slightly different way on Android. Starting with the iOS version of the Android keyboard Gboard, where the feature is called Glide Typing—make sure it’s enabled in the keyboard settings if you want to use it. The same feature is also available in SwiftKey for Android and iOS, where it’s called SwiftKey Flow, but works in almost exactly the same way. If you want something built on the idea of swiping to type, try Swype Keyboard for Android, though it’s no longer available on iOS unfortunately and will set you back $0.99. The app comes with a host of extra customization options and themes as well.